Nespresso Machine Archives - Simple. Quick. Nespresso Story is a story about the research and development team at Nestlé who created a simple but revolutionary concept during the 1970s. The idea was that anybody could make perfect espresso in their homes or offices similar to the cups served at the highest quality Italian coffee cafes. Only handful of people know the real Nespresso Story. Before achieving success as a global leader in the industry, Nespresso went through many phases that helped shape and define the company we know today. The founding Nespresso staff comprised just five employees. Once the company created their logo, they began testing their machines, coffee, and concept in select areas of Switzerland, Italy, and Japan. These initial test markets focused on the business sectors. Nestlé SA introduced their first Nespresso machines between the years 1986 and 1994. The first machine designs included a handheld capsule holder, like the ones used by baristas that make traditional espresso. Maximizing the customer coffee experience was always the goal of for the company’s business model. Although these early years involved lots of experimenting and mistakes, the first superior quality varieties of Nespresso capsules mirrored that objective. 1986 – Capriccio, Cosi, Decaffeinato, and Bolero are the first four flavors of the Grand Cru capsules. 1989 – The company introduced their Nespresso Club. 1991 – Household Nespresso systems launch throughout France and the United States. The Nespresso brand grew in popularity throughout Europe as the company established their customer base within the coffee community. By the late 1990s, their early success contributed to a financial milestone, a break-even point. Nespresso reached new heights when Aerolux manufactured their first coffee machine for aviation purposes. In 1995 they installed this machine on Swissair to continue branding the business towards luxury and first class clientele. 1996 – To promote the brand and product line, Nespresso launched their first website offering coffee expertise to their customers. 1998 – Nestlé officially changed the name of their company to Nestlé Nespresso SA. 1999 – Nespresso launches a new commercial product line targeting small and medium sized businesses, high-class restaurants, and premium hotels. After their financial breakthrough, Nespresso continually introduced new machines and Grand Cru coffees targeting both consumer and business markets. Before the turn of the century in 1998, Nespresso enhanced the existing website with an e-commerce platform allowing their customers to order machines and coffee online directly. Nespresso gained recognition from coffee drinkers outside of the European markets, causing their growth and profits to rise. The profits were reinvested into the company as they continued on the path of innovation and customer convenience. In 2001, they released the first Limited Edition Grand Cru coffee. With each passing year, Nespresso reaches new customers across the globe. For the first time, Nespresso developed an espresso machine that eliminates their manual capsule holder. Instead, the new machines have a mechanism that mimics the motion of an opening jaw to insert the capsule. The new and innovative design simplified the process and created a cleaner procedure than the earlier machines. 2000 – Nespresso opened their first concept store coffee boutique in Paris on the Rue du Scribe. 2001 – The springtime limited edition flavor is called Blue Batak from Sumatra. 2002 – To keep up with their growing brand, Nespresso opened their first production center, which operates in Orbe, Switzerland. To improve the welfare of farmers, Nespresso collaborated with the Rainforest Alliance to achieve social responsibility. They formed the AAA Sustainable Quality Program, which guaranteed the production of high-quality coffee beside helping the farmers. Nespresso officially launched their Essenza machine with a top loading capsule slot. All subsequent machines followed the influence of the Essenza concept, making it a milestone development for their product line. In 2004 Nespresso’s Grand Cru coffee line extends to 12 total recipes. The recipe increase came after introducing the Lungo product range besides milk and iced coffee formulas. Nespresso’s foundation of high-quality coffee and machines established brand loyalty amongst their customer base and created sustainable success as a business. In 2009, they launched a program called Ecolaboration to reduce their carbon footprint on the environment, which involved the proper disposal and recycling of their capsules. Nespresso Club members chose the actor, George Clooney, to be a brand ambassador for the company. The first advertising campaign with the actor was released in 2006. The following year Nespresso released their Latissima machine that included new technology including fresh milk and other specialty coffee recipes with a simple button system. 2007 – Nespresso opened their first flagship boutique in Paris on the Champs-Elysées. 2008 – A new facility opens in Avenches, Switzerland for production and distribution. 2011 – The Pixie machine is released, which is the company’s smallest and most energy efficient coffee maker. Nespresso reached another milestone when they opened their 200th boutique in Shanghai. By the end of 2010, the boutique number grew to 215 worldwide as more shops opened in the major cities like Miami, Brussels, Sydney, New York, and Munich. Nespresso achieved their goal to of sourcing 80% of their product from farmers in the Sustainable Quality Program and cut their carbon footprint by 20%. The design team introduced the VertuoLine machine system designed for the North American markets where consumers prefer larger cups of coffee. 2012 – The first Nespresso boutique opens in San Francisco, marking the company’s west coast expansion in the United States. 2013 – Nespresso introduces the Nespresso Cube, which is a concept involving automated retail for customer personalization and an innovative shopping capability. 2014 – In Vienna, the first Nespresso Café opens, introducing a premium coffee shop experience. Nespresso continued advancing their Grand Crus product line with three new decaffeinated products. The new decaf blends, Vivalto Lungo Decaffeinato, Volluto Decaffeinato, and Arpeggio Decaffeinato, match the fragrance of the most popular capsules. Today, Nespresso is a global trendsetter and leader in the coffee industry. The company continues to strive for innovation and excellence with their coffee and machines. It is the start of another week and the memory of last night’s party is still fresh in your mind. The headache is not going away, and you need something strong to kick start the day. But the long waiting line at the coffee shop just will not do. All you desire is a cup of coffee that can help you start the day and keep you fresh. The Nespresso VertuoLine Coffee and Espresso Maker comes in handy. You can start off the day with your favorite beverage or a delicious cup of traditional espresso, all with Nespresso VertuoLine Coffee and Espresso Maker. Now you can say goodbye to the long waiting lines and the lukewarm coffee. With Nespresso VertuoLine Coffee and Espresso Maker, you can have the perfect cup of coffee, right in the comforts of your house, while you save time and money. Nespresso VertuoLine Coffee and Espresso Maker comes with a plethora of features that will revolutionize your coffee making. 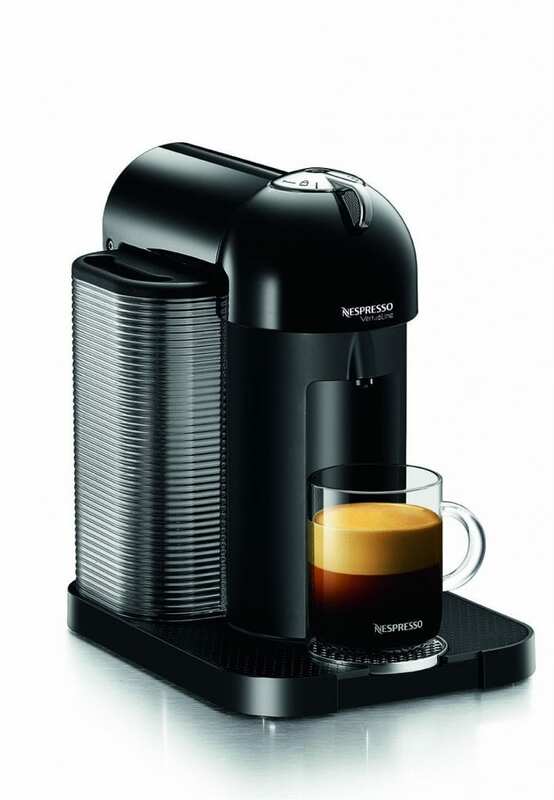 Size – The compact size of the Nespresso VertuoLine Coffee and Espresso Maker makes it an easy appliance to store. At just 12” deep and 8.3” wide, this appliance can be easily stored virtually anywhere in the kitchen. Be it the kitchen at home or your office, Nespresso VertuoLine comes at a 12” height, making it compact and easy to fit anywhere. You can let it sit on the countertop or place it in one of the overhead cabinets. Wherever you want to store it, the small dimensions of the appliance would not be a problem. Style – The retro look of the Nespresso VertuoLine makes it a must-have for all kitchens. Add the oomph of your kitchen needs. Keep it on your kitchen countertop and let its elegance complement your house décor. Speed – With a heating time of only 15-20 seconds, you can save time while making coffee—an advantage over those long waiting lines at the coffee shop. Now you do not have to halt your fast track life to make time for a cup of coffee. With such a low heating time, Nespresso VertuoLine can get you your favorite cup of coffee in a jiffy. Quality – With a patented automatic system, you can be sure that Nespresso VertuoLine will provide you the best they have. With millions of users all over the world, the quality of Nespresso VertuoLine cannot be questioned. Adjustable – Having a Nespresso VertuoLine means being at ease since it can be adjusted according to your coffee needs. With three adjustable cup heights, you can accommodate the small espresso cups, your coffee mug, and even the large sized travel mugs. Now that is convenient! Just brew the coffee and let the machine do all the work. All you have to do is pick up your mug and enjoy the taste of perfectly brewed coffee. Ease of Cleaning – Cleaning the machine once a week is a good idea, especially if you use it frequently. The process is the same as the first-use cleaning procedure and is quite easy. One Touch Simplicity – You can sip the traditional espressos or enjoy your favorite hot beverage. All of this at the touch of a button. Wide Coffee Range – Nespresso capsules offer a wide range of aromatic coffee choices for its VertuoLine machines. The capsules come in two sizes—one for coffee; Stormio, Odacio, Melozio, Elvazio, Hazelino, Vanizio, Decaffinato and Half Caffeinato—and a range for espressos; Diavolitto, Altissio, Voltesso and Decaffeinato Intenso. Fully Automatic Operation – The one touch button feature makes the Nespresso VertuoLine easy to use and time-saving. The simplicity of the whole function makes it an ideal appliance for coffee lovers who want the easy way out from the traditional brewing techniques. The machine automatically shuts down after 9 minutes, saving energy. Each capsule is automatically recognized by the machine, allowing it to perfectly extract the taste and aroma of each blend. CentrifusionTM Technology – This is a unique feature of Nespresso VertuoLine, makes for the perfect extraction of flavor and aroma. Mornings can be difficult, especially Mondays. No matter how the rest of your day goes, you can be delighted in the fact that with the perfectly brewed coffee from Nespresso VertuoLine, your morning would be gorgeous. With the right amount of caffeine in your system, you can kick start the day with zeal and enthusiasm. The used capsules eject into an internal container, meaning that you do not have to go about cleaning up a mess. The capsule container has a capacity of 13 used capsules. The automatic blend recognition and the CentifusionTM Technology makes it one of the most favorite coffee machines, which not only saves time, but is simple and easy to use. People love Nespresso VertuoLine, but there are a few cons to this amazing coffee and espresso machine. Since you can only use capsules compatible with VertuoLine, you cannot afford to run out. This is an inconvenience faced by many Nespresso users. If you want a cup of coffee or your daily espresso, you need to have some capsules available, or you would have to do without your caffeine kick. A lot of people have not been happy with the temperature of the coffee. That is definitely something that must be looked into. At such a hefty price, coffee lovers expect to get the best. The machine does not come with a built-in milk frothing feature, and you could buy the Nespresso Aeroccino milk frother. But it will add to the overall price of the machine. The Nespresso Aeroccino comes in three options—Aeroccino3, Aeroccino4 and Aeroccino Plus. The coffee does taste good, and Nespresso VertuoLine Coffee and Espresso Maker defines simplicity and time-saving. So if you overlook the price and the few cons of the product, it is a pretty impressive appliance. All coffee lovers can enjoy their favorite beverages, without having to leave the comforts of your home. So enjoy the creamy, aromatic coffees with Nespresso VertuoLine and get the energy you need to get over the Monday blues. A day without coffee is bound to do downhill, especially for all the coffee lovers. Because unless they get the strong shot of espresso or that steaming cup of Americano, kick starting the day is not possible. The first sip of coffee is enough to transport them to coffee heaven; the finest place to be at, first thing in the morning. The coffee shop just around the corner may offer the finest coffee in town but are you ready to wait in a seemingly endless queue, just to shake off the weariness of the day before? You need an instant cure, and that can only be achieved when you get that cup of coffee before you step out of your house. Do not fret; with the latest addition to Nespresso Vertuoline, you can fulfill all your coffee desires. The simplicity and time-saving features of Nespresso Evoluo Coffee and Espresso Maker are bound to leave you wanting for more. Be it the expertly brewed Italian espresso, or your favorite cup of classic American coffee, with Nespresso Evoluo Coffee and Espresso Maker, you will be in a coffee bliss that will be hard to come out of. Nespresso Evoluo Coffee and Espresso Maker is an appliance that combines convenience with great taste. Are you ready to explore the darkest of your coffee passions? If yes, then be amazed by the amazing features of Nespresso Evoluo Coffee and Espresso Maker. Size – Nespresso Evoluo Coffee and Espresso Maker comes in a compact size, that is convenient and the perfect solution for your storage problems. With a depth of only 12.2” and a 9” wide body, this appliance is easy to store and can be placed anywhere in your kitchen or office. Its height of 12.3” makes it ideal to be placed on countertops. Since they do not take up much space, you would not have to worry about hoarding up the countertops. Style – The premium finishes and the chromed accents of Nespresso Evoluo are the perfect appliance to complement your kitchen interior. The model lends a stylish look to your kitchen, making sure that everybody notices sitting on the countertop. So why hide this beautiful machine in a cabinet? Place it as the highlight of your kitchen and make the most out of this amazing coffee maker. Speed – Nespresso Evoluo offers a heat up time of only 15-20 seconds. So no more waiting to get your caffeine kick of the day. While you put on your shoes, your coffee will be brewed at the right temperature so that you can enjoy the steamy cup of coffee. Quality – Nespresso promises the best quality for all its appliances. You can be sure that you will get the same taste and aroma with Nespresso Evoluo, even after years. Flexible – The integrated drip tray and movable cup support in Nespresso Evoluo provides you the flexibility to make the right quantity of coffee, even in tall glasses. You can easily adjust the cup support to accommodate different types of mugs and glasses for different coffee recipes. Easy to Clean – The drip tray catches any spilled beverage, making the cleaning process easier. For daily cleaning, however, you only have to clean the surface and components with a damp cloth. One Touch Simplicity – The simple process of one-touch brewing allows for a perfectly brewed cup of coffee within a matter of seconds. The only thing you have to do is insert the coffee capsule in the machine. One touch and your coffee or espresso would be ready. The machine will do the work for you. Getting a cup of your favorite beverage has never been easier. Wide Coffee Range – Nespresso capsules offer a wide range of aromatic coffee choices for its VertuoLine machines. The capsules come in two sizes—one for coffee; Stormo, Odacio, Melozio, Elvazio, Hazelino, Vanizio, Decaffinato and Half Caffeinato—and a range for espressos; Diavolitto, Altissio, Voltesso and Decaffeinato Intenso. Fully Automatic Operation – The fully automated system allows you to get your favorite hot beverage with no hassle at all. A single touch and hey presto! Your favorite cup of steamy coffee or espresso is ready. The automatic shutdown option will not let the machine sit idle. When not in use, the machine will automatically switch off after 9 seconds. Even the capsule discharge is automatic. The used capsules will conveniently move to the used capsule container that has a capacity of 17 used capsules. CentifusionTM Technology – This superb technology extracts the flavor and aroma out of the coffee capsule. The patented technology spins the capsules more than 7,000 times per minutes, which perfectly blends the coffee with water and produces the optimal results. Capsule Recognition – Each Nespresso capsule comes with a bar code, and the machine scans it to decide on the right temperature and the perfect blending conditions for each capsule. This ensures that every time you get your desired beverage, brewed to perfection. Well, with all the amazing features that Nespresso Evoluo offers, it is a must have for all coffee lovers. Whether it is the CentifusionTM Technology or the Capsule Recognition Technology, all these features contribute to making the machine a convenient and time-saving device. The used capsules eject into an internal container, meaning that there is less mess. The container has a capacity of storing 17 used capsules. With Nespresso Evoluo, the hassle of cleaning the coffee machine is something you can finally get rid of. Nespresso Evoluo comes with its cons, which, though few, must be addressed. Although the machine comes with full instructions on descaling and the process is simple enough, it can take you some time to complete the process to your satisfaction. People may find the machine inexpensive, but the capsules are quite pricey, which can increase your coffee bills significantly. Nespresso Evoluo does not have the ability to froth milk on its own, so if you need that, you would have to buy separate milk frother. The Nespresso Aeroccino comes in three options—Aeroccino3, Aeroccino4 and Aeroccino Plus. An excellent way to conveniently get a cup of coffee right in the comfort of your home! Nespresso Evoluo Coffee and Espresso Maker is a heaven for coffee lovers, and you would not want to miss out on this amazing appliance. However, if you have a limited budget and do not want to spend too much on buying compatible capsules, you would better steer clear of this machine. Quality and flavor wise, this is one product you would love to own. ‘If coffee cannot fix it, it is a serious problem.’ Am I right, or am I right? The popular quote would ring a bell close to the lives of so many people, actually almost every person who loves coffee and relies on it to go through the whole day. Every day, all over the world, hundreds of people become the victim of long waiting lines at the coffee shops. All they desire is a cup of coffee to start their day, but the epidemic of long waiting lines have forced people to give up on their love. Jokes apart, when coffee is all you need to kick start your day, coffee is what you should get. With the simplicity achieved from Nespresso VertuoPlus Coffee and Espresso Maker, there is no more delay! The sleek and classy look of Nespresso VertuoPlus Coffee and Espresso Maker and its simple features combines convenience and style. Size – The 5.6” depth and 16.2” width gives it a compact look and makes it easy to store almost anywhere. Whether it is your kitchen counter or the cabinet in the office kitchen, Nespresso VertuoPlus Coffee and Espresso Maker will easily fit in. Although it is slightly taller than the other models, the 12.8” height will not cause any problems with the overhead cabinets. Style – The elegant look of Nespresso VertuoPlus Coffee and Espresso Maker, combined with the chrome finished outer makes it the perfect appliance for your stylish kitchen. Not only will it add to your kitchen’s décor, but it will also stand out among all the other appliances. The stylish look is hard to beat. Speed – The soothing hum of the Nespresso VertuoPlus beats the clanking sound that most coffee and espresso makers omit. The advanced, ultra-quiet CentrifusionTM technology brews the perfect cup of coffee each time, with a heat up time of just 20 seconds. Quality – Never settle for less. Nespresso VertuoPlus makes sure that you get a machine that does not only have a smart and sleek design, but has the finest quality as well. Your Nespresso VertuoPlus will last for a long time, providing the same taste you had fallen in love with, every time. Adjustable – You bet it is! The 40 oz water tank attached to Nespresso VertuoPlus is rotatable. You can move it to the back or on either side of the machine, depending whichever style suits your storage space. The cup holder can also be adjusted to the height you want. So whether it is the small espresso shots or a huge mug for your daily coffee sip, Nespresso VertuoPlus is equipped to cater to all your coffee desires. Ease of Cleaning – Just use a damp cloth to wipe off the surface and you are good to go. Yes, it is that simple! The used capsules’ container is also pretty easy to empty. Make sure you do not wait till it is full to the brim to empty it. One Touch Simplicity – All you need to do to get a cup of your favorite coffee is press a button. Yes, just that! Nespresso VertuoPlus is one of the best coffee makers in the market, known for its time saving and convenient features. CentrifusionTM Technology – The deafening drone of most coffee makers is enough to make your ears bleed, but with the CentrifusionTM technology of Nespresso VertuoPlus, your ears can get a rest. This superb technology quietly extracts the flavor and aroma out of the capsule. The patented technology spins the capsules more than 7,000 times per minutes, which perfectly blends the coffee with water and produces the optimal results. A heaven for all coffee lovers. Fully Automatic Operation – With the fully automated system of Nespresso VertuoPlus, you do not even have to tell the machine which beverage to make. The machine identifies the capsule and does all the work. The motorized opening and closing of the brew head makes for the most simple and time-saving coffee making. Computerized Scanning System – Each Nespresso capsule comes with a barcode, and the machine scans it to detect which beverage it is. All you have to do is pop in the capsule, and the machine will do the rest. The machine decides on the right temperature and the perfect blending conditions for each capsule, ensuring that you get your desired beverage, brewed to perfection. The simple, one button system of Nespresso VertuoPlus not only simplifies the whole process of brewing coffee but also saves your precious time. With that deadline right ahead, the last thing you want to do is waste time. Nespresso VertuoPlus sees to it, providing you just the right kind of booster; your favorite cup of coffee. The used capsules eject into an internal container, meaning that there is less mess. The container has a capacity of storing 8-12 used capsules. With Nespresso VertuoPlus, the hassle of cleaning the coffee machine is something you can finally get rid of. Do not forget the CentrifusionTM technology. The best extraction technology that gives you a perfectly blended cup of coffee, every time. Not only do you save time, you actually save a lot on your monthly coffee bills. Nespresso VertuoPlus Coffee and Espresso Maker is not without a few cons. Although it is one of the best machines on the market, some users have come up with some valid points against Nespresso VertuoPlus. The major one is its price. Most people deem it too expensive but coffee lovers are surely going to dig it. All Nespresso machines use compatible capsules. So if you run out of capsules, you would either have to wait till you can get some new ones, or you would simply have to get back in that long waiting line at the coffee shop. Latte art fans would be disappointed with this machine by Nespresso. With no options for the milky frothy texture, you might miss on the whole latte art fun. You would need to add the Nespresso Aeroccino milk frother and that involves additional investment to the overall price of the machine. The Nespresso Aeroccino comes in three options—Aeroccino3, Aeroccino4 and Aeroccino Plus. If you are willing to overlook the price, Nespresso VertuoPlus Coffee and Espresso Maker is the perfect choice. Whether you are a fan of traditional Italian espresso or love the taste of classic American coffee, with Nespresso VertuoPlus, you will be living in coffee bliss. It is the start of another week, another day and the same Monday blues! It is just too difficult to shake off the cobwebs and get ready for work. The only thing that can help is a steaming cup of coffee, made especially for you—a cup of coffee that has a tempting aroma and the strong flavor to help you start your day. So, get ready for the epic journey to the coffee shop with amazing features on the way like ‘the traffic’. If that did not make your day bluer, enter the coffee shop and experience the amazing sensation of ‘waiting’. While you watch other people get their order, you can easily call your workplace and inform them that you will be late, again. Everything is going perfectly smooth, is not it? Exactly the way you wish to start your day? Did you just answer with a big, resounding ‘No’? Of course, you did! That is why you need a coffee machine that gives you the perfect start of the day, with that perfectly blended cup of coffee. And Nespresso Creatista Plus Coffee Machine is the answer to all your coffee troubles. The stainless steel Nespresso Creatista Plus Coffee Machine and its fully automatic features make it a must-have device for your house. Size – It is 12.5” depth, and a 7” width makes it compact enough to be stored anywhere easily. The stainless steel surface complements the décor of any kitchen. And being 12” high, it can easily fit on the counter top under your overhead cabinets. You would not need to worry about moving bulky machines because Nespresso Creatista Plus Coffee Machine weighs only 5.3 pounds. Easy to move, easy to store. Style – Nespresso Creatista Plus Coffee Machine has a unique and eye-catching style. The high gloss finish and sleek design add elegance to your kitchen. The stainless steel silver outer and the intuitive digital display also reflect the state of the art technology used to get you the ease of making coffee. Speed – With a 3-second heat up time, you do not have to wait any longer for your favorite cup of coffee. All you have to do is switch on the machine and let it do the rest. With 11 different milk temperature settings, you decide the perfect temperature, and the Nespresso Creatista Plus will oblige. Quality – Never settle for less. And Nespresso Creatista Plus makes sure that you get a machine that does not only have a smart design but is also the best in quality. 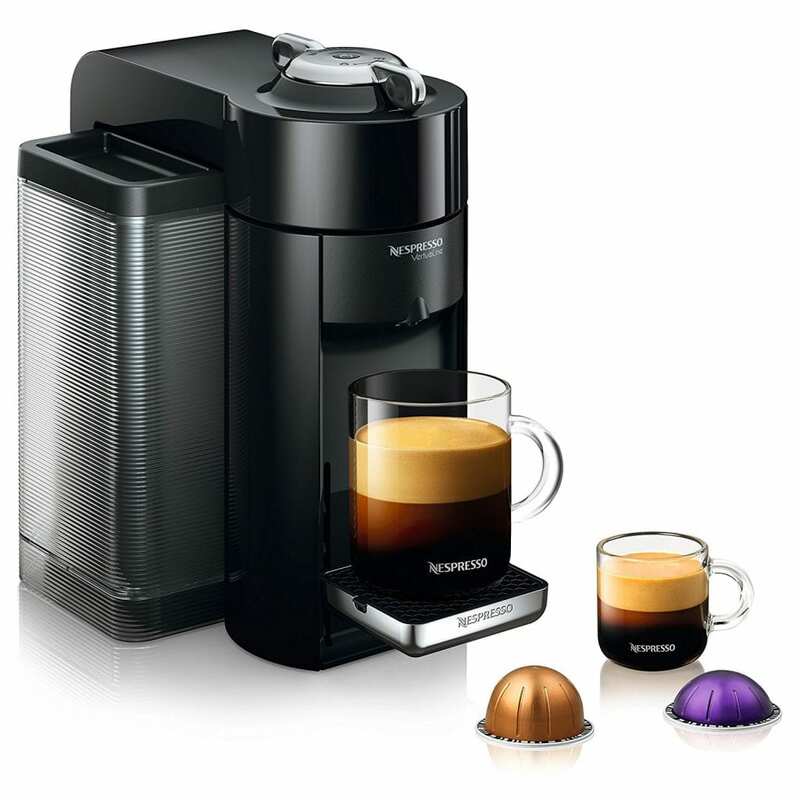 With its range of refined accessories, you can be sure that Nespresso Creatista Plus will serve you for years to come. Adjustable – You prefer black coffee, but your partner loves an aromatic cup of Cappuccino in the morning. No worries! You can create your favorite coffee with Nespresso Creatista Plus and its amazing feature of multiple coffee recipes, 8 to be precise. Not only that. You can even adjust the frothing levels of your coffee, with the provided option of 4 textured levels. Let your creativity flow and let each cup of coffee be a piece of art. Creative – The most amazing feature of the Nespresso Creatista Plus is its automated Steam Wand. You can take your coffee experience to the next level and create latte art, right there in your kitchen! The Nespresso Creatista Plus makes the milk so smooth and silky that you will not be able to resist the temptation of trying your hand at latte art. Let your imagination run free and let the creativity flow. Ease of Cleaning – The assisted cleaning system will help you clean the steam wand. Select Maintenance on the Touch Panel, select Clean Steam Wand and just follow the on-screen prompts. And you only have to do this at least once a month. Regularly clean the machine and all its components with a clean damp cloth and you are done. It is as simple as that! One Touch Simplicity – No more getting confused! All you have to do is press a button and sit back to relax. The machine will do the rest. 19 Bar Pressure Pump – The pump provides the pressure to extract the flavor from the coffee capsules. This way, you can be sure that the aroma and flavor of each capsule are fully extracted to give you the best cup of coffee. Wide Coffee Range – Nespresso capsules offer a wide range of aromatic choices with six families to choose from; Intenso, Pure Origin, Espresso, Decaffeinato, Lungo, and Variations. And with the automated programming, you can easily prepare, Ristretto, Espresso, Lungo, Cappuccino, Latte, Flat White, and Latte Macchiato. Fully Automatic Operation – The easy to use color display will provide you the ease of one touch, along with the start dial and the Start/Cancel button. The system can even let you decide the cup size, so you get just the right amount of coffee, every time. These three automated functions are all you need to get a cup of coffee that helps you start the day off! The easy-to-use features and the fully automated functions allow you to enjoy café style coffee, especially made for you. The automatic power off after 10 minutes not only saves you money but also ensures that your Nespresso Creatista Plus has a long working life. The used capsules eject into an internal container, meaning that there is less mess. The container has a capacity of storing 8-12 used capsules. The highly efficient operation of the 19 bar pressure pump provides you with a quality cup of coffee every time. A cup of coffee that captures all the flavors of the capsule and it is a feature not many appliances can boast about! Nespresso Creatista Plus surely does have a lot of features, but a few things hold it back from being the public favorite. People find it too expensive, a reason that is quite valid. Most coffee lovers would not worry about the price if they can get a café styled coffee maker right at home, but the price is an issue for many. Although the cleanup process for the steam wand is easy, some units require regular cleaning which can be a bit of a hassle. When the machine only uses compatible capsules, you can be sure it is a recipe for disaster. If you run out of capsules, it is either back to the coffee shop or brew the coffee yourself. Nespresso Creatista Plus Coffee Machine is the best thing in the market right now, as long as you are willing to overlook the price. And if you are into latte art and wish to start your morning off with intricate designs on your coffee, then Nespresso Creatista Plus is made for you. Nothing can match the warm buzz that a cup of coffee gives you, and when it is the first thing in the morning, you can be sure that it will be a good day. For most people, coffee is not just a beverage. It is a ritual, something they would not want to compromise on. You can easily get coffee anywhere; the market has become too saturated but what about that perfect cup of coffee? The one with the perfect taste and aroma? That is a rare commodity and is hard to find. Would not you love to wake up to the aroma of freshly poured coffee? A scent so divine you cannot help but enjoy the whole experience of drinking coffee. And if it is a shot of espresso, then you would be set for the day! With Nespresso Lattissima Pro Coffee Machine, you can enjoy that perfect cup of coffee, in the comforts of your home. Is not this all the inspiration needed to start a day? A hot, steamy cup of coffee, sitting there, waiting for you? Or to be more precise, a cup of authentically Italian espresso-based beverage? Yes, this is what Nespresso Lattissima Pro Coffee Machine offers you, the chance to kick start your day with the help of the coffee machine that allows you to enjoy the espresso experience, at home. Nespresso Lattissima Pro Coffee Machine is an appliance that combines convenience with flavor. It is an appliance that lets you explore the darkest corners of your passion for coffee. Size – The compact size of Nespresso Lattissima Pro Coffee Machine has its advantages. With a 13” height, it’s easy to store, literally anywhere in your kitchen. And with an 11” depth and an 8” width, you can place this sleek appliance right on the counter top. Storing it in cabinets is also easy because of the compact size of the appliance. Style – The premium finishes and the Italian design of Nespresso Lattissima Pro not only reflects elegance but with its one-touch technology, you get the added glamor that will complement your kitchen. The refined brushed aluminum and chrome plated finish make it stand out among all your kitchen appliances. The compact stainless steel body gives the machine an industrial look. No need to hide it in a cabinet; let it sit on the countertop and increase the appeal of your kitchen. Speed – Nespresso Lattissima Pro is one of the appliances that have the lowest heat up time. You can start brewing your favorite coffee beverage in just 25 seconds. Now that’s what you call fast! Quality – With a patented automatic cappuccino system, you can be sure that Nespresso Lattissima Pro would last longer than the other coffee machines on the market. All you have to do is clean and maintain it regularly. And you can be sure that the machine will give you best quality coffee for a long time. Flexible – The Nespresso Lattissima Pro comes pre-programmed with six beverage preparations, but you can easily customize them using the touch screen menu. Even the cup holder is adjustable, allowing you to use different cups for each beverage. The chrome plated cup support folds out or down, depending on the cup size. The automatic shut down feature leaves you free to enjoy your perfect cup of coffee. Easy to Clean – With Nespresso Lattissima Pro, you would not have to worry about aggressive cleaning rituals. The milk system components are dishwasher safe, so there go your worries. The appliance includes a semi-automatic daily cleaning option too. For daily cleaning, however, you only have to clean the surface and components with a damn cloth. One Touch Simplicity – No more getting confused! The one button technology of Nespresso Lattissima Pro allows you to enjoy quality beverages at a single touch. So just sit back and relax. The machine will do the work for you, and you can enjoy the fine taste of a creamy latte or a perfectly brewed Italian espresso. 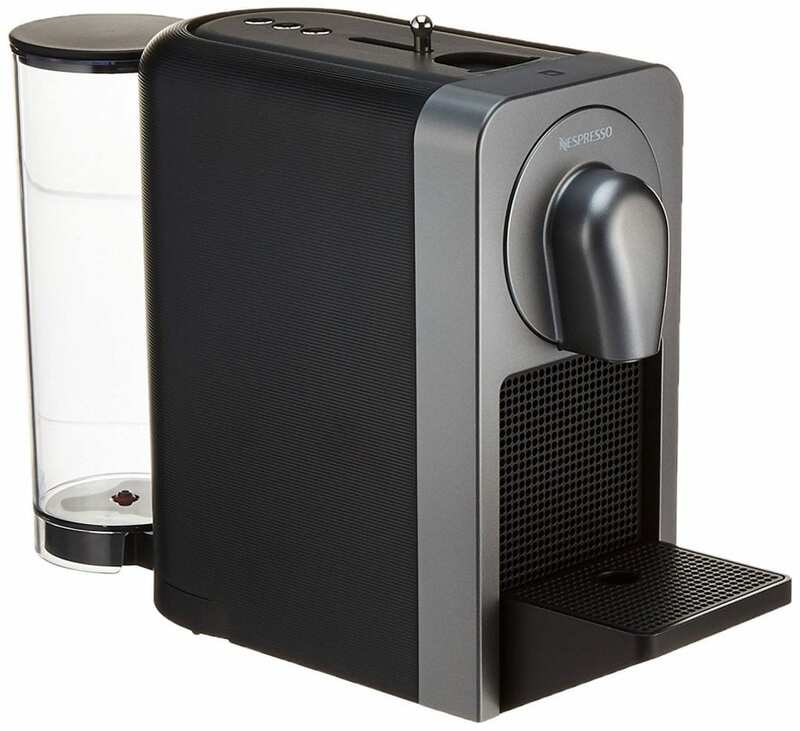 19 Bar Pressure Pump – Nespresso Lattissima Pro comes with the 19 bar pressure pump which ensures that all flavor and aroma is efficiently extracted from the capsules. Wide Coffee Range – Nespresso capsules offer a broad range of aromatic choices with six families to choose from; Intenso, Pure Origin, Espresso, Decaffeinato, Lungo, and Variations. With six pre-programmed drinks, you have a wide variety to choose from. Tantalize your taste buds with ristretto, lungo, espresso, latte, cappuccino, and hot milk. Or go for the hot water function for tea. Fully Automatic Operation – The touch sensitive system provides the ease to make a perfect cup of coffee, without having to deal with confusing buttons. The automatic power shut down saves energy. The touch sensitive control pad not only allows you to choose your drink but it also displays reminders. The appliance would itself tell you when to de-scale it and when to clean the milk unit. Nespresso Lattissima Pro gives you the caffeine kick you need to start your day. With no longer waiting in lines, this appliance has an advanced steamer technology that allows you to be a barista. Yes, really. The milk froth texture regulator gives you the exact foam density and quantity that you desire. The used capsules eject into an internal container, which has a capacity for about 8-12 capsules. Since the milk does not come in contact with the machine, all you have to do is remove the milk unit and rinse it. For your ease, it is dishwater safe; so no cleaning hassles anymore. You can even take it out and store in the refrigerator. With a 19 bar pressure pump, you can be sure that you get the same tasting and aromatic beverage every time. Nespresso Lattissima Pro comes with its cons, which have to be addressed. Customers find the cleaning option a bit too time-consuming. The machine cleans the milk spout after each use, and although the process is easier, it is time-consuming. The small components can be tricky to clean. The price is also an issue for many people. Since the machine only uses compatible capsules you cannot afford to run out. You would always need to keep some spare capsules or else you would end up starting the day without your favorite beverage. With Nespresso Lattissima Pro Coffee Machine, you can save a ton on your coffee bills, and since it is easy to use, you do not have to go through the lengthy coffee making process each morning. If you do not mind the price and the time taking cleaning, then this appliance is for you. You can enjoy incomparable coffee at the touch of a button. What more can a coffee lover ask for? How many people do you know who need a strong cup of coffee to shake off the cobwebs? The chances are that you are among them! The fact is, the idea of having a steamy cup of coffee first thing in the morning seems like the perfect start of the day and yet, just thinking about that long line at the coffee shop is enough to ruin the day. You can either get up early each day to be at the coffee shop at the break of dawn or just bear with the morning rush hour crowd. None of the two options sounds good, right? You can either bury your love for coffee, go through the same ordeal every day, or you can just go easy on yourself and get the Nespresso Lattissima Touch Espresso Maker! Not only will this make your life easier, (no more long lines, no more rude servers, and no switching up of orders), but it also saves time. The best part is that now, no one will ever misspell your name on the cup. And the coffee? Once you have had a steaming, frothy cup of coffee made by the coffee expert, Nespresso Lattissima Touch Coffee Machine, you will not be able to give it up. The sleek look of the Nespresso Lattissima Touch Coffee Machine and its advanced features make it the perfect appliance to have at your home. Size – The compact size of the Nespresso Lattissima Touch Coffee Machine makes it easy to use and store. Unlike other bulky espresso makers, it will not hog up any space on the counter, and at only 10” high, it is easy to place just about anywhere, without taking up much space. Its 7” width and 13” depth give it just the compact look you would expect from Nespresso. Style – Just like the ease of its touch functions, the design, and style of Nespresso Lattissima Touch Coffee Machine reflects simplicity and glamor, perfectly befitting any kitchen. Speed – The Thermoblock feature of Nespresso Lattissima Touch Coffee Machine makes it one of the appliances that have the lowest heat up time. Your beverage is ready in just 25 seconds. Now that is fast! Quality – With a patented automatic cappuccino system, you can be sure that Nespresso Lattissima Touch is the best of the best. Adjustable – With Nespresso Lattissima Touch, it is all about the adjustments. You can get perfectly layered coffees and get creative with the milk froth option. You can even choose the texture of the milk froth for days when you feel like going for a more frothy coffee. The best part is after you are done, you can remove and store the milk container in the fridge. One Touch Simplicity – No more getting confused! All you have to do is press a button and sit back to relax. The machine will do the work for you, and you can enjoy the fine taste of a creamy latte and a perfectly brewed espresso. 19 Bar Pressure Pump – The extraction system of Nespresso Lattissima Touch gives you the perfect combination of coffee. With 19 bars of pressure, the water flows ideally, providing the ultimate pressure to extract flavor and make each cup especially according to your taste. Wide Coffee Range – Nespresso capsules offer a wide range of aromatic choices with six families to choose from; Intenso, Pure Origin, Espresso, Decaffeinato, Lungo, and Variations. 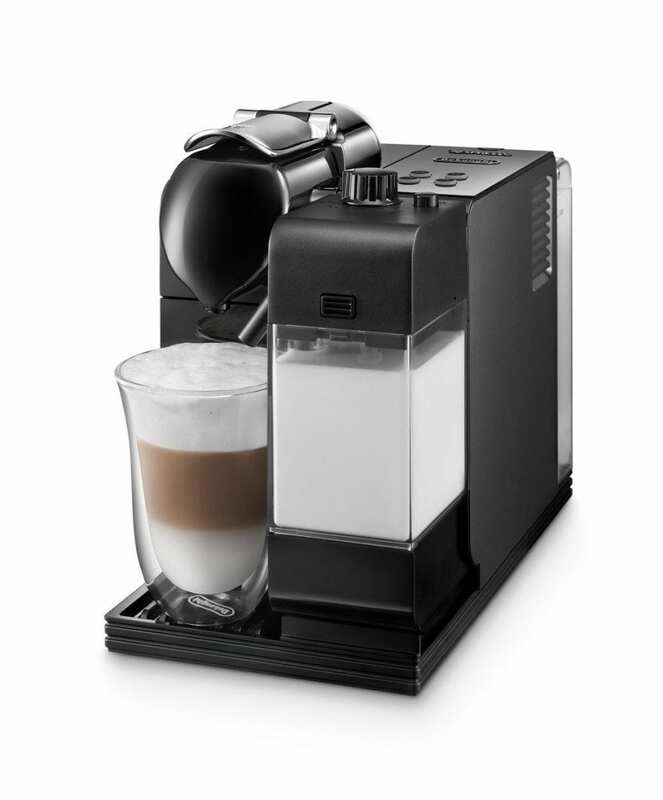 Fully Automatic Operation – With six easy to use buttons, making coffee has never been easier. The one touch system provides the ease to make a perfect cup of coffee, without having to fiddle with numerous buttons. The automatic power shut down saves energy, and the cleaning could not have been easier. With de-scaling and cleaning alerts, your Nespresso Lattissima Touch notifies you whenever it is in need of a thorough clean up. All you have to do is press the clean button, right next to the froth texture regulator. Ever had a morning when nothing went your way? The alarm did not ring, your shoe broke, your sweater snagged on the bedroom door, and the coffee maker took hours to brew a fresh cup of coffee? Even on such days, your Nespresso Lattissima Touch will make you a perfectly blended coffee in a short time. All you have to do is insert the desired capsule, and your coffee will be ready in no time, without any mess. The used capsules eject into an internal container, meaning that you do not have to go about searching through all the compartments. Since the milk does not come in contact with the machine, all you have to do is remove the milk carafe and rinse it. For your ease, it is dishwater safe; so there go your cleanup problems. The highly efficient operation of the 19 bar pressure pump provides you with a quality cup of coffee every time. It is a feature not many appliances can boast about! Although the many features of Nespresso Lattissima Touch make it the most desired household appliance, there are a few blemishes that need to be addressed. Customers find it hard to fill the water tank. The complexity of the system makes it difficult for them to complete this task. Although it is wide, the hinged lid makes it almost impossible to fill from a tap. Cleaning up the machine is a simple process, but the milk unit requires regular cleaning which can be a drawback. All Nespresso machines use compatible capsules, which can be inconvenient if you run out. You would always need to have a stock of capsules to be able to enjoy your favorite hot beverage. You can save on your monthly coffee costs if you opt for the Nespresso Lattissima Touch Espresso Maker. Not only is it convenient because of its fully automatic operations, but its price also makes it one of the most affordable machines in the market. So leave all the hassles of getting a coffee behind and get Nespresso Lattissima Touch. With the amazing features of this compact machine, you can enjoy your favorite coffee, with just the right amount of foam, anytime you like. Your search for the perfect at-home coffee shop experience ends with the Nespresso by KitchenAid Espresso Maker. This powerful home coffee machine combines the delicious flavor of artisan-crafted Nespresso pods with iconic metal builds to bring you the coffee bar experience without paying a barista. From two names you already trust for top-notch kitchen appliances, the Nespresso by KitchenAid Espresso Maker delivers quality coffee at the touch of a button. If you’re looking for an exceptional home espresso machine, this unit just might be the perfect fit. With a host of features, you’ll soon wonder how you lived without, the Nespresso by KitchenAid Espresso Maker changes the way you see your morning cup of coffee. 19-bar pressure pump – Good espresso comes from impeccable pressure. Too much, and the shot is over-extracted and harsh. Not enough, and the shot is under-extracted and weak. The Nespresso by KitchenAid Espresso Maker provides the happy balance with a 19-bar pressure pump that gives you well-extracted shots every time. Attractive retro design – The whimsical retro design of this espresso maker is at home in any kitchen setup. With its rounded top and edges and chrome details, this model fits in with your KitchenAid mixer and other appliances. Multiple color choices – The Nespresso by KitchenAid Espresso Maker comes in a variety of color options so you can coordinate it with your kitchen design or existing appliances. There’s sure to be a color option for everyone, choose yours. All metal construction – An all-metal, diecast construction makes this machine an instant classic as soon as you take it out of the box. It’s easy to clean and durable for cup after cup of delicious coffee. 1.3-liter water storage – Store enough water to make multiple rounds of coffee without having to fill up. The large-sized, 1.3-liter water storage container keeps you brewing through many capsules without having to think twice about your water supply. Removable water tank – When it does come time to fill your water tank, it detaches from the unit for filling. No more trying to bring water to your coffee pot and risk splashing it all over the counter. Just fill and replace for fresh coffee when you want it. See-through tank design – Don’t know when you need to refill? A handy see-through tank design lets you see into your water tank to gauge when you need to add more. Measurement markers along the side give an accurate read, so you know how much water remains in the tank. Push-button service – When you’re ready to brew, just press the button and let the machine get to work. No worrying about messing with coffee grounds or measuring out the water. Sliding cup holder – A sliding cup holder lets you customize your platform height to allow whatever coffee mug you want to use. Whether you want to fill a shot glass with a single espresso shot or need to fill your trusty favorite mug to the brim, you can adjust the platform height to the level you need to minimize drips and splatters when brewing. Removable drip tray – A removable lower drip tray accommodates your larger coffee mugs. No more tilting your favorite travel mug to fill it up. Remove the drip tray, place your mug and fill it up in a few quick seconds. Three cup sizes – The Nespresso by KitchenAid offers three cup sizes to help you find your new favorites. Whether you’ve got a craving for some strong espresso or want to sip coffee through your morning routine, you can choose how much you want. Sizes include a ristretto, standard espresso, or lungo. Six pre-programmed setting – Calibrate the machine to suit your cup and your drink making intentions. If you want to pull shots for a latte or need to leave enough room in your cup for cream, dial the brew strength selector and let the machine take care of the rest. LED indicator – An intuitive LED indicator puts you in control of your brewing experience. Choose options for cup size and calibration through an easy selection. No need to worry with complicated instructions for getting the coffee you want. Heats quickly – The Nespresso by KitchenAid heats in an under 30 seconds to deliver your hot coffee as soon as you need it. In the time it takes to grab your mug, coffee capsule, and cream, this espresso maker is ready to go. Compatible with Nespresso capsules system – Whether you’ve been a fan of Nespresso coffee for years or are new to the system, this coffee maker is the perfect way to expand your collection or embark on a new adventure. This model is compatible with the Nespresso capsule system. The Nespresso by KitchenAid will take your coffee experience to new heights with fresh flavors and delicious Nespresso capsule blends. Easy pod loading – Loading Nespresso pods into this espresso maker is as simple as you could imagine. Insert the coffee pod in, close the unit and let the machine take care of all the details. Internal pod storage receptacle – Once you’re done with a pod, the Nespresso by KitchenAid stores it out of sight in its internal pod storage container. It holds up to 14 used pods so you can go a little while without worrying about cleaning it out. No more trying to balance a hot, used pod to the trash can. Automatic shut off – Do you wonder whether you remembered to turn off the coffee maker? The Nespresso by KitchenAid eliminates this worry with its automatic power-off mode. What makes the Nespresso by KitchenAid different? The Nespresso by KitchenAid is unique from other coffee makers because it combines some of the best features of two popular kitchen brands. From the KitchenAid aesthetic to the Nespresso capsule system, you get the best of both worlds when you choose this machine. 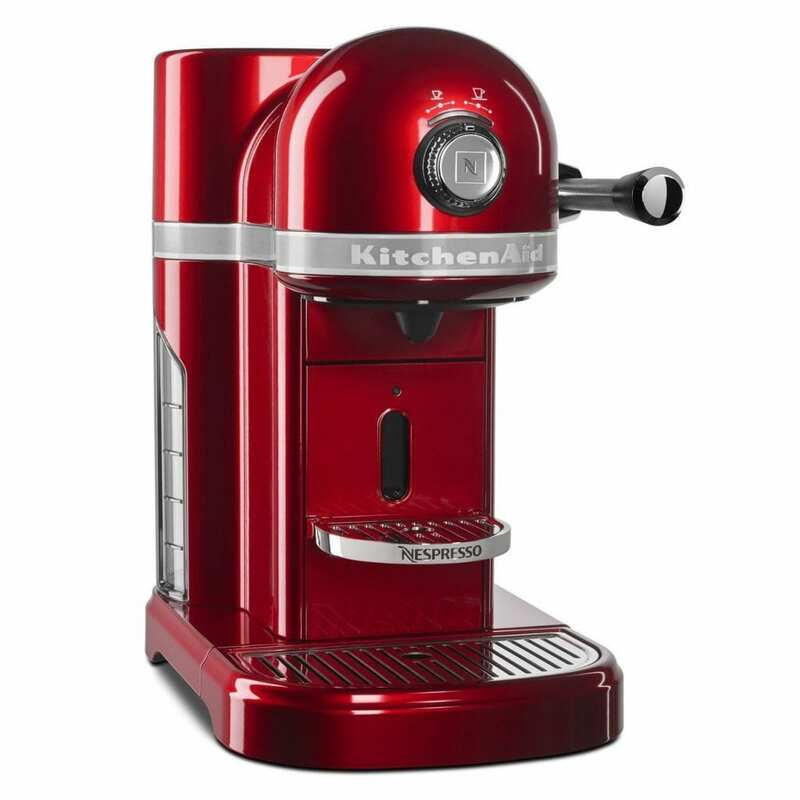 No other espresso maker will match your Nespresso by KitchenAid appliances quite as well as this one will. Likewise, the integration of Nespresso’s proprietary capsule system brings you ease of use that you’ve come to know and love from both brands. The Nespresso capsule system allows you to broaden your coffee horizons by trying new blends from growing regions around the world. The best part is that you don’t need to worry about messing around with coffee grounds and filters to get the brew you desire. Simple load and go. No onboard milk frothing – One of the best features of having an at-home espresso maker is being able to make your coffee shop favorites at home. However, the Nespresso by KitchenAid does not come with a milk frother, making it a disappointment in this area. A separate Aeroccino milk frother from Nespresso is available for purchase, but that does drive up the investment in your home espresso system. This unit doesn’t attach to the KitchenAid unit, meaning that you’ll need to store both appliances separately. The Nespresso Aeroccino comes in three options—Aeroccino3, Aeroccino4 and Aeroccino Plus. Locked into Nespresso capsules – The Nespresso Grands Cru capsules can get pricey over time, though they are still cheaper than going to a coffee shop, which makes the investment worthwhile in many consumers’ eyes. They’re also not environmentally friendly because you have to throw away each one, which contributes to your personal waste footprint. No water level sensor – Some users report frustration with the lack of water sensor to keep track of how much water is in the tank. While the see-through design allows you to notice this on your own, it can be difficult to gauge exactly how much water you need per cup. If it empties without your noticing, you risk losing a capsule by having to end the cycle mid-process due to an empty tank. This Nespresso by KitchenAid Espresso Maker is for any coffee lover who wants to bring the fresh espresso experience straight to their home. This unit is handy because it blends in with appliances that many home cooks already have in their kitchens. 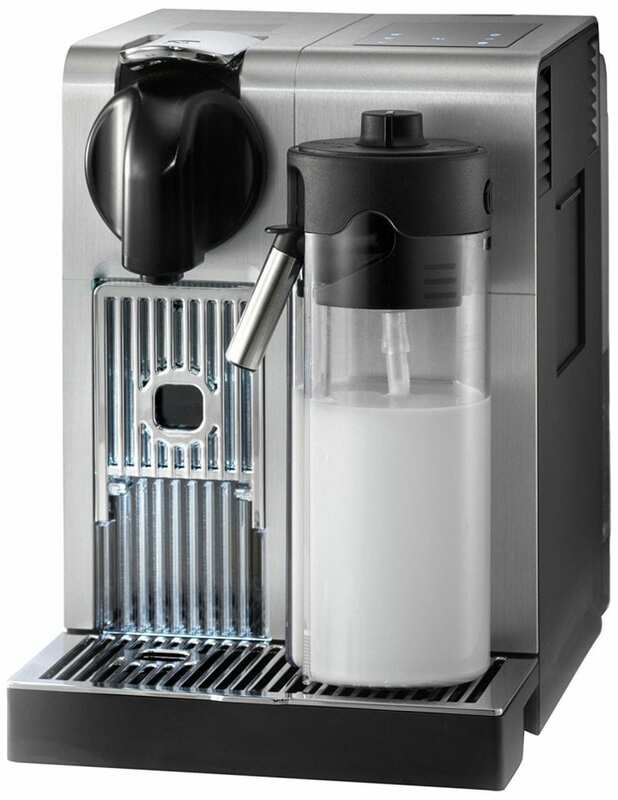 Its compatibility with Nespresso capsules and the Nespresso Aeroccino milk frothing system gives you plenty of variety when working with coffee drinks. Overall, this machine is a great investment for coffee lovers who don’t want to invest in an expensive manual espresso machine just yet. Wake up to a delicious cup of coffee every morning and not just on special occasions. A custom latte on the way to work isn’t just a rare splurge thanks to newer coffee makers on the market today. Now, you have a way to make coffeeshop-quality coffee at home without having to wait in line during your morning commute. With the Nespresso Lattissima Plus Coffee Machine, it doesn’t have to be! Nespresso Lattissima Plus Coffee Machine is the answer to your coffee dreams. This small but capable espresso machine provides you with the ideal latte-maker components you need at the touch of a button. With included espresso making and milk frothing capabilities, the Nespresso Lattissima Plus Coffee Machine brings the coffee shop experience right to your kitchen counter. You don’t have to wait in line or examine complicated menu options. Program the Nespresso Lattissima Plus Coffee Machine to remember your favorites and have it deliver the perfect cup of coffee every time. The consistency and delicious coffee are what customers love the most about this product. Here are some of the key features of the Lattissima Plus. 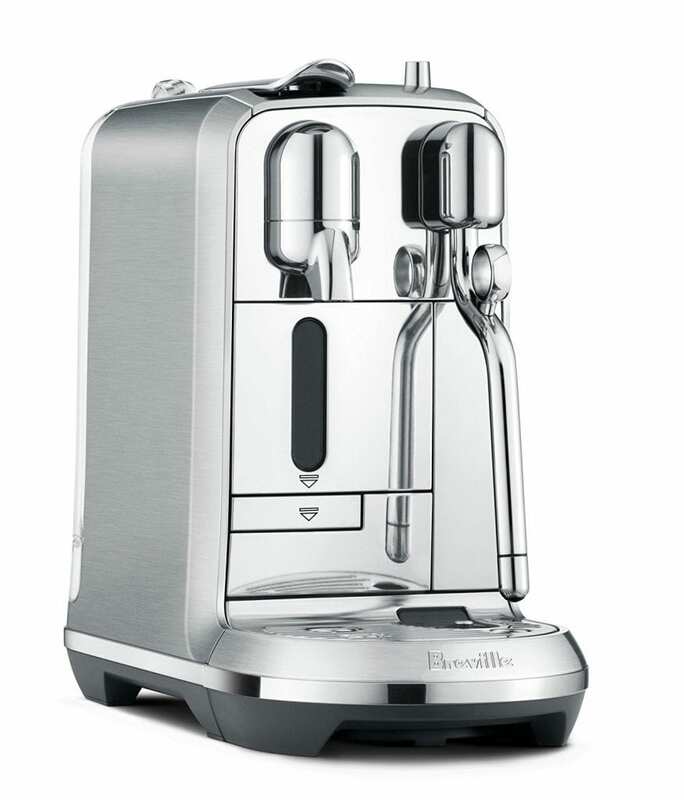 Single unit with two functions – The Lattissima Plus brews espresso and froths milk all in one machine. This takes up less space on your counter. It also means you just have to work with one machine to prepare your coffee from start to finish. Single touch hot milk system – Steamy, frothy milk each time you make a latte by using the intuitive hot milk system. You don’t have to worry about splashes or figuring out a complicated mechanism. Just push a button and steam. Removable milk tank – The milk tank comes out for easy filling and cleaning. It slides out of the front of the machine. It’s self-contained, so it doesn’t create a mess everywhere. Clean button for milk tank – Don’t worry about accumulating grossness in your milk tank. Press the clean button to give it a thorough washing and remove old milk residue or any other unpleasant bits left behind. Illuminated panel – An illuminated panel makes it easy to spot the drink selection you want. You no longer have to stumble around in a dark kitchen when you first rise out of bed. Now you can make your latte without disturbing the rest of the house when you turn on your kitchen lights. Multicolor machines – The Lattissima Plus comes in Black, White, Red and Stainless Steel that complement your home decor. Three milk options – Choose your milk frothing options to add a little or a lot of foam to your latte. With customizable selection, try your hand at making cappuccinos, macchiatos, and more. Two coffee selections – Choose from espresso and lungo coffee sizes to mix up your coffee for different times of the day. Espresso works best when paired with milk options, but the beauty of the Lattissima Plus is that you don’t have to choose. Do whatever strikes your fancy and find your perfect drink! Nespresso Grand Cru capsule system – The Lattissima Plus contains an integrated Nespresso capsule system right in the unit. That means you can access your favorite Nespresso drinks or make one of the artisan-crafted blends your new usual. The Nespresso capsules are easy to use and provide a dependable, delicious cup of coffee with every use. Adjustable auto-off timer – Save energy with an adjustable auto-off setting that turns the Lattissima Plus off after a certain amount of inactive time. This way, you don’t need to wonder whether you remembered to turn the espresso machine off before you went to work in the morning. Sliding drip tray – A sliding drip tray moves up and down to accommodate your coffee cup, no matter how tall it is. If you want one shot, you can slide the drip tray up close to the spout to hold your shot glass. Remove the drip tray and fill your insulated travel mug as you head out the door. Coffee shop elegance – With its sleek, classy design, the Lattissima Plus is a professional-looking espresso machine. Its crafted angles, muted tones and aligned segments speak of Italian design. This unit looks like it belongs in a high-end coffee shop. One-touch latte options – Simplify your coffee routine with one-touch coffee dispensing. Customize your milk and coffee options and let the machine do the rest as soon as you select the brew option. Welcome kit – Each Lattissima Plus comes with a welcome kit that contains a variety of Nespresso pods. You also receive informational paperwork about warranties and the Nespresso Club. Self-priming features – You don’t need to worry about getting the Lattissima Plus up and ready to go. 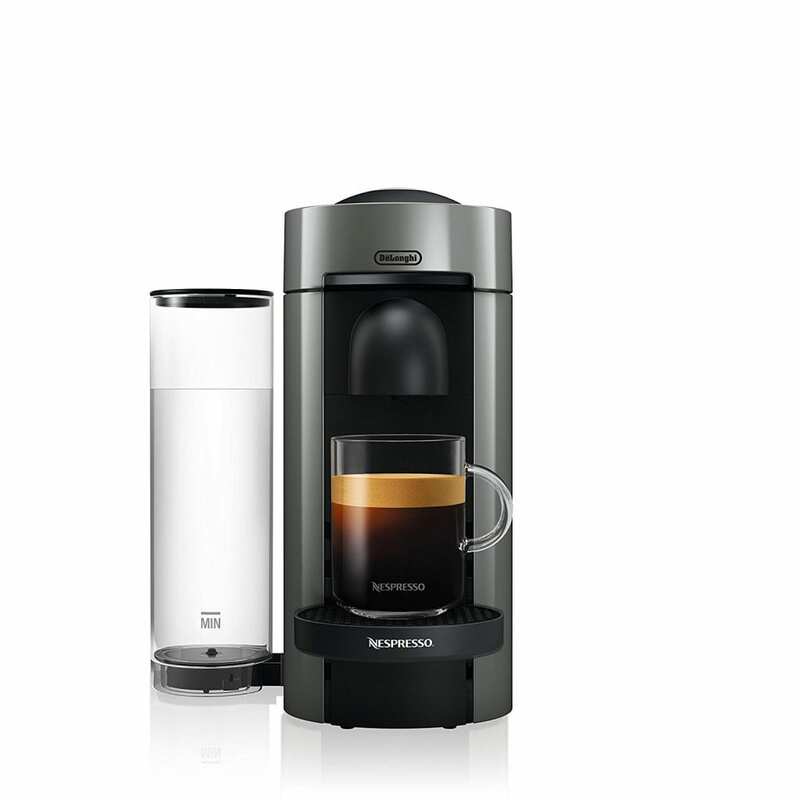 With its self-priming features, it warms itself right up and prepares to brew coffee for one or for the whole family. What sets the Nespresso Lattissima Plus Coffee Machine Plus apart? The Lattissima Plus is different than other espresso machines on the market in several ways. The biggest difference is that this unit makes the home coffee shop experience easy and approachable for coffee lovers of any skill level. Sure, there are higher-powered espresso machines on the market. Many of them come with complex instruction manuals and a prerequisite advanced understanding of coffee preparation. For the non-barista, these machines might be too intimidating to even consider adding to a home kitchen. Don’t forget the price tags on high-end machines that can rival budget-priced motor vehicles! Lower-end espresso machines require some knowledge of espresso prep. They may not include a milk frother. That requires the purchase of two machines to create coffee shop favorites. Many models still require espresso beans and a grinder, both of which can get messy and add a lot of time to your coffee-making routine. With all of the options and additions that some standard espresso machines require, most people just go to the coffee shop for a latte or cappuccino. This is why the Lattissima Plus is such a relief for coffee lovers. The Lattissima Plus cuts through all of the noise. You don’t need technical skills and complicated machines to make espresso the traditional way. With the Lattissima Plus, all you need to know is what drink you like and how to push a button. The expert design and perfect calibration of the Lattissima Plus puts years of coffee skill and mastery into one powerful machine. The small appliance delivers perfect beverages straight to your cup. You don’t mess with coffee grounds. There’s no coffee knowledge required. When you’re on the go, or just want a great cup of coffee, there is no better alternative than the Lattissima Plus. The machine prepare all of your coffee shop favorites that you love. Best of all, this happens right in the comfort of your own kitchen. The Lattissima Plus offers much more functionality than a traditional drip coffee maker, but takes up the same amount of space. There’s no need to devote half of your counter space to a complex coffee set up or try to find someplace in your home to set up a coffee bar. The Nespresso Lattissima Plus Coffee Machine offers undeniable convenience and coffee shop quality that most other home espresso machines cannot accomplish. It offers a great choice for anyone who wants to dabble in making espresso drinks at home. From lattes to macchiatos, this two-in-one espresso machine with milk frother gives you the opportunity to whip up delicious coffee beverages day after day. If you want to save some space on the counter or simplify your coffee routine, then the Lattissima Plus is the machine for you. With the many options available from Nespresso, you can play around with settings and flavors until you find your favorite ones. No barista experience is required! Hate waiting in line every morning to order your coffee? The average trip to the coffee shop can take up to ten minutes during busy times. That does not even count the amount of time you spend battling traffic to get to your favorite coffee shop! What if you could have the coffee shop experience without having to go to the cafe? With the Nespresso Prodigio Espresso Maker that dream can become your reality. This incredible coffee maker is part espresso machine, part miracle worker to make your mornings go even smoother. Not only does the Nespresso Prodigio Espresso Maker work with Nespresso’s delicious Nespresso capsules choices, but it even connects to your phone, so you can place your order before getting out of bed. The Nespresso Prodigio packs with features you will love. As a top-of-the-line instant espresso machine, this little appliance packs quite the punch! Easy to use – Nespresso machines are easy to use. That is one of the best features of their line of intuitive coffee machines. From simple button operation to capsule selection, everything you need is at your fingertips. Go ahead, ditch the manual. Nespresso Prodigio Espresso Maker will guide you through the process. Sliding pod holder – To insert a pod for brewing, just slide it into the slot and the Nespresso Prodigio Espresso Maker will do the rest. Press your button and watch as the little capsule transforms to a delicious cup of coffee right before your eyes! Three drink sizes to choose from – Whether you want a little coffee or a lot, the Nespresso Prodigio Espresso Maker has got you covered. There are three sizes: Ristretto, Espresso, and Lungo to offer the perfect pick me up all day long. Ristretto is a unique size to the Prodigio and allows you to pull a single serving of espresso so that you can enjoy a quick, flavorful shot without being overwhelmed by its punch. 19-bar pressure pump – Get that coffee shop experience with perfectly pulled shots from the 19-bar pressure pump. The Prodigio delivers shot after excellent shot with remarkable consistency and flavor. Plus the pressure release is entirely automated so the Prodigio extracts your perfect espresso without you having to figure out the details of pressure as you might on a standard espresso machine. 25-second heat up – In less time that it takes you to grab a bowl of cereal, your Prodigio heats up and is ready to go. No need to stand around waiting for water to heat or a drip coffee maker to do its thing. Once the 25 second period has passed, you can brew yourself some hot, delicious coffee. Compact design – The Prodigio is not a large countertop appliance. With a small footprint that is less than a square foot in size, it fits well into even tiny kitchens. Even if you are used to the added oomph of a professional espresso machine, there’s no way any model could beat the Prodigio in size! Rotating water tank – A rotating water tank helps the Prodigio fit into your kitchen. Whether you are storing it under a cabinet or in the corner, position the tank to a place you can easily reach. This rotation makes the filling and cleaning a breeze. Pod storage reservoir – Inside the Prodigio is a handy used capsules storage reservoir. This container holds up to 19 used capsules. If you enjoy a cup a day, the reservoir will hold over two weeks’ worth of old pods! With the swift and automated capsule ejection process, it makes using the Prodigio even easier since you do not need to empty old capsules every time you brew. Bluetooth connectivity – The Prodigio is Nespresso’s first smart coffee maker. It connects to your smartphone via an app and Bluetooth. Download the app for iPhone or on the Google Play Store to get started with brewing coffee from across the house. Multiple users can connect to the Prodigio to make coffee from any app-enabled device in the house or office. Intelligent auto brewing – With smart sensors and onboard storage, the Prodigio remembers your coffee the way that you like it. Simply put your pod in and position your cup. It will handle the rest. The Prodigio remembers your coffee size to give you the right amount without having to select it each time. Nespresso capsules – With astounding variety, the Nespresso capsules have a little something for everyone. Choose your favorites among medium-roast Livanto or the light Capriccio to the fruity Volluto and the very mild Cosi. Instant options – The Prodigio comes with 16 included Nespresso pods for your enjoyment. Try a variety of flavors and decide your favorites, or enjoy sipping something different every morning. Easy reordering – The Nespresso Club can be accessed right from your smartphone app. This makes reordering your capsules a breeze. Simply get in touch with the Club to order more pods, day or night. Foldable drip tray – A foldable drip tray makes it easy to put any cup underneath the coffee spout. Simply fold it away to accommodate your travel mug or leave it in place for a standard one. Sure, there are other espresso machines on the market. However, the Prodigio is unique for its wireless connectivity, and it is the first Nespresso machine to offer this feature. From the ease of wireless connectivity to ease of automatic use, this machine is a clear step up from the time-intensive coffee shop experience. Why pay a barista to do what your Prodigio can in a fraction of the time? 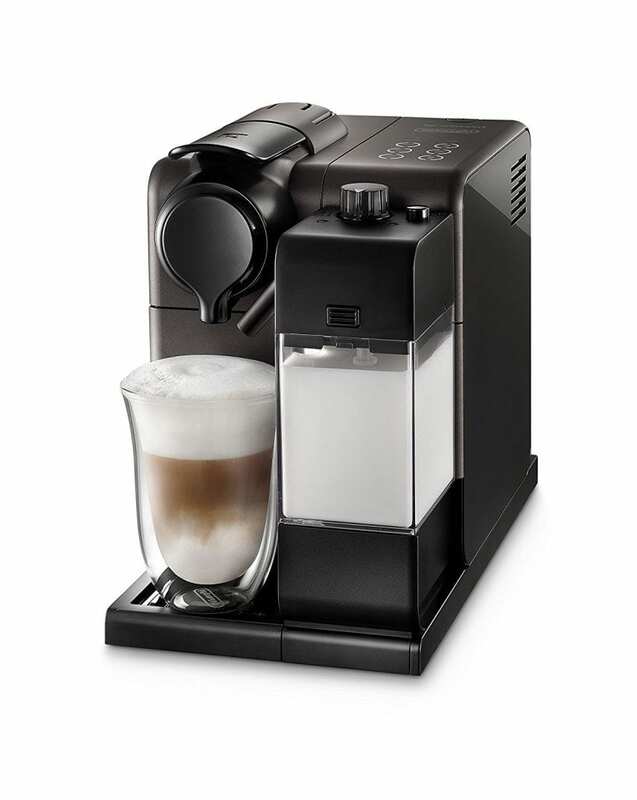 Superior coffee and a host of choices make this machine a great option for even the pickiest of coffee connoisseurs. You can choose your flavors, pick among three sizes, and have the machine start brewing when you want fresh coffee. You can even control this machine remotely with a smartphone app. These are winning features due to the convenience! One thing that the Nespresso prides itself on is great customer service. If there are any problems, you can contact customer service 24/7 for technical support. Considering the wireless connectivity and high-tech features, tech support can help you optimize your machine for your lifestyle. If your machine breaks down, Nespresso sends you a new one provided it is during the warranty period. The company gives you a loaner machine until qualified technicians complete the repairs. If you want a milk frothing option, you can add on the Nespresso Aeroccino milk frother. You get a slight discount if you purchase both the brewer and milk frother together, the Nespresso Prodigio&Milk Espresso Maker. There are, of course, other third party milk frothers that can accomplish the same task as the Aeroccino. The Prodigio has many great features. However, there are some places that it could only use some improvement. For starters, the Nespresso capsules, though undeniably convenient, are quite pricey and will put you back quite a few dollars a day if you drink a lot of coffee or have multiple family members using the machine. Then there is the environmental impact of so many capsules to consider. While they are technically made from recyclable aluminum, remembering to separate them from the regular trash may not be the easiest thing to remember. There are third party options for reusable pods, but they do not quite measure up. Additionally, the Prodigio does not offer an option for frothing milk. While you can purchase the Aeroccino separately, this is a pricey addition and adds another step. Moreover, the Aeroccino does not connect to the app via Bluetooth, so it adds a manual component to your automatic coffee process. Some users complain about the Bluetooth connectivity not working as well as advertised. Depending on your phone, this may be an issue. Wireless internet may interfere with the connectivity, but tech support can help you work out any issues. Overall, the Prodigio’s Bluetooth feature could have been thought out a bit better. Since the Prodigio is the first connected coffee maker in the Nespresso line to hit the market, it is understandable that there are some Bluetooth glitches to work out. You will probably be able to use and enjoy it just fine, however, as with any new tech, the first version is usually a bit buggy. If you are concerned about connectivity issues being a problem for you, you can always hold out until an updated version is released. You will love the Nespresso Prodigio Espresso Maker for the innovative new technology it is bringing to home espresso brewing. From coffee flavor varieties to the Bluetooth connectivity, this is the coffee machine for people who need coffee and need it now. Whether you are running out the door for work every morning or enjoy savoring your afternoon coffee on the back porch, the Prodigio is an ideal espresso maker for your home. You can choose your size and use the machine intel to remember your pick for next time. Best of all, you can skip the coffee line and enjoy your home-brewed espresso every day of the week.